Everyone knew what Juan Lagares brought to the table defensively, but the question remained as to what he would bring with his bat. There were grumbling all of spring training in concerns to if Lagares would hit enough to be an everyday player. So far, he has put all of those concerns to rest. It’s not just that he’s hitting, but it’s when he’s doing his damage. This franchise has lacked players that come through in the clutch for some time now, and in a small sample size, Lagares looks like one of those guys. April 5th against the Reds – In the bottom of the 9th, Lagares works a leadoff walk that ultimately lead to an Ike Davis walk-off grand slam. April 9th against the Braves – With the Mets down 4-0 in the top of the 9th, Lagares singled in two runs to keep a late rally going against the best closer in the game, Craig Kimbrel. 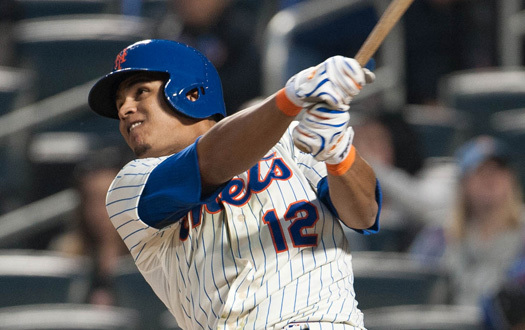 April 10th against the Braves – The game was tied in the 7th inning last night when Lagares singled in the winning run. On the season Lagares has an offensive split of .303 AVG/.351 OBP/ 1 HR/ 6 RBI. If he is able to keep hitting near this level, he won’t be known as just a defensive specialist. His knack for coming through in these late inning situations is what has impressed the most about him. The 25-year-old never appears overwhelmed and simply looks like he belongs. His youthful energy and style of play is something that has energized this team and their fans. Lagares is the best defensive outfielder the Mets have had since Carlos Beltran, in his healthy years. Beltran was as smooth as it came at tracking down fly balls. He made every play look so effortless, as few people made the game look as easy as Beltran. It’s not hard to see that similar style in Lagares’ game. He possess an arm that appears to be even stronger than Beltrans’ once was to go along with the speed of a leadoff hitter. The biggest difference I have noticed between the two is Lagares’ ability to make the spectacular play. As great as Beltran was, he didn’t routinely make the “wow” plays the way Lagares does. Maybe part of that was just his style of play, but either way, Lagares is a walking highlight reel out in centerfield. At this point and time, you would have to consider Lagares the second best all-around player the Mets have behind David Wright. Although the Captain has had some struggles at the plate early on, we know he will turn things around. Lagares has shown he is much more than a platoon player and could be a name that more than just Mets fans know soon enough.